Matt / matte labels are more subtle than gloss, with a flat, soft look and feel. Please complete the form below and we will contact you asap, usually within 1 working hour. If your order is urgent, please complete the form and call us on 1300 663 242, and we’ll get you on track fast. If your label is a custom shape or cut lettering please attach a file for reference. 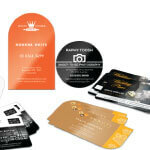 Lamination adds to the turnaround time and additional costs apply. Are you printing more than one set of files? Sheeted is more cost effective. Increased savings with longer turnaround. Turnaround time is dependant upon product and volume, if you have a large order but only need a proportion quickly, please let us know in the notes section. My artwork is print-ready.Check artwork / make print-ready.Layup basic artwork with supplied assets.Create a new design for us. For an accurate delivery cost estimate. Accepted file types: eps, pdf, jpg, jpeg, gif, png, ai, psd, ind, tif, xlsx, csv, indd. Look great, with Matt Vinyl Stickers. 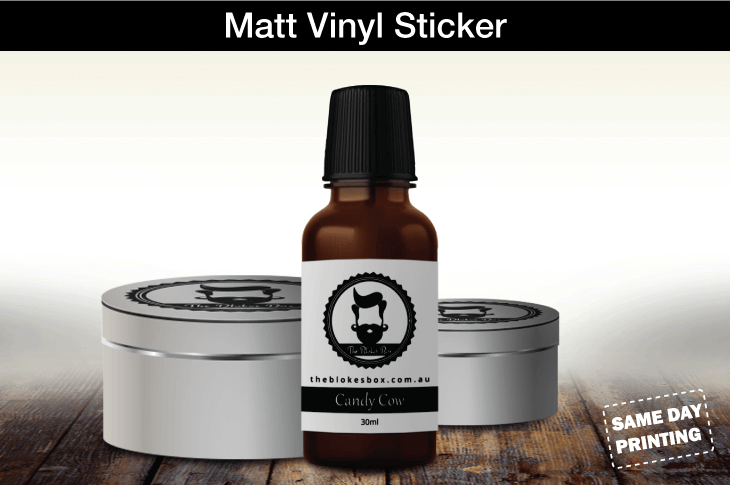 Whether you like matt for its soft subtle refinement, or because it is a trendy finish for your demographic, these labels are sure to impress. Same Day Printings high resolution quick print and dry technology provides the ability to turn some orders around within a day, you can get your stickers / labels / decals fast. Give us a call to discuss your requirements – call 1300 663 242. 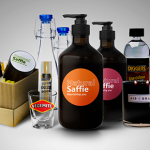 Used for a wide variety of product labelling as well as window stickers and promotional handouts, vinyl stickers and labels come in either a gloss, or coated matt finish. They are weatherproof and can confidently be used for up to 3 years1 outdoors without lamination – and up to 5 years1 or more with lamination. Vinyl labels have good clarity, are not easily torn and will not wrinkle when exposed to moisture. 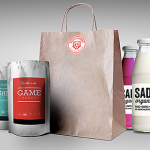 Sheeted: Vinyl labels are print and cut to specification, so almost any shape is possible. 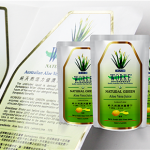 Our labels come standard with 1mm rounded corners, and supplied on sheets approximately A4 or A3 depending on your label size and requirements. If you need a custom sheet size, or a certain number of labels per sheet, we can help. Singles: We can supply vinyl labels as singles with a kiss cut, so your label peels off the backing in the shape of your choice. Great for give-aways or when your team need to take just one per job. We need 2mm as the thinnest section for cut lettering for vinyl stickers, as when it is thinner than this the letters move or come off while the backing is being removed. 2) Put a box behind the text – either across all words or following the outer edge of each word, still with a 1mm outer border. 3) As per number 2, but print on a clear stock with a whie ink underlay behind text, so the border/background is the clear sticker rather than a coloured print. We’re passionate about meeting your last minute graphic design and print needs, and helping you make the most of EVERY opportunity. Ensure your message sticks! 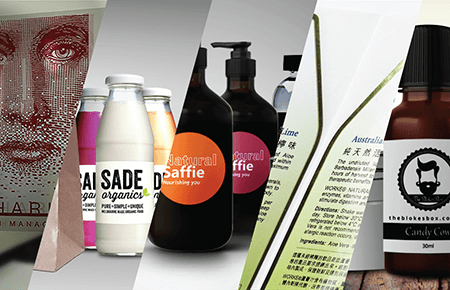 Labels are perfect for communicating product information or keeping your brand front of mind. 1,2 Outdoor display permanence tested according to SAE J2527 using HP Latex Inks on a range of media, including HP media; in a vertical display orientation in simulated nominal outdoor display conditions for select high and low climates, including exposure to direct sunlight and water; performance may vary as environmental conditions change.